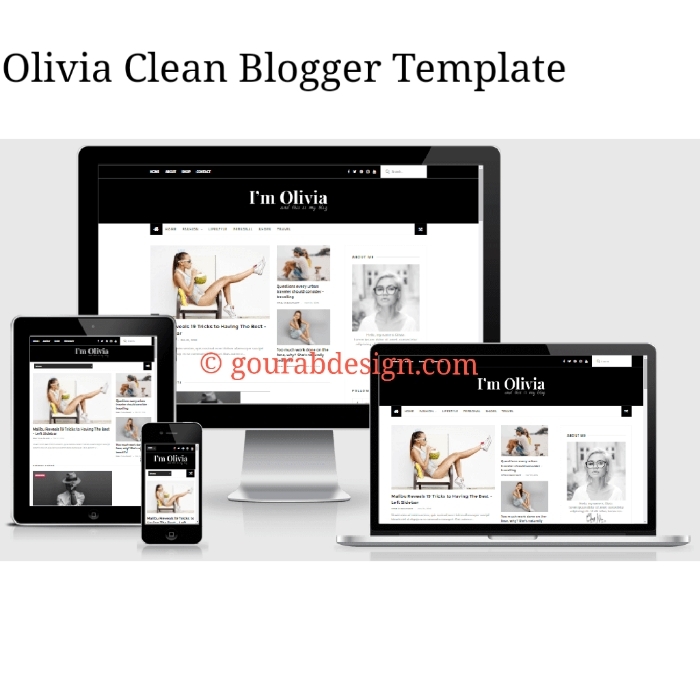 Olivia Clean Blogger Template in Lifestyle Magazines is the perfect that is lightweight in minimalist. Here you will find all the fun things you need, go to blogs of magazines, among others. It's a great opportunity to design your blog, fashion blog,. This is a sensitivity of what means that your content will appear in every mobile device. You are looking for a your Photography Website model?., So it is said to be best option for you. Olivia is a blogger who shared a photographer. Say you're an opportunity, come live in blog mode. This topic is ideally a blogger, travelers in photography. An unlimited feature is that your website will be incredible. It is in a clean template with beautiful elegant design. What's new:- We are added all in one seo pack. Heading tag Optimizes. I means h1 or h2 tags. Also css and html5 add this .first you check demo then better option for you download this button below here. It's easy to navigate menu. Design for creative photo creators, food, lifestyle, kings, personal blogging is a must. This is the perfect opportunity to get photos and blogs. This is where you can find css3 / html5 technology. Here you will shared your image to internet. Olivia is the subject of multiple designs. The default background view is white in the header. The black-green is almost identical, wants to show a black head background. The award-winning gallery in a static slideshow in the message section. Your bio writers widget in the sidebar. Sweet browsing on search box widgets. He added the Instagram gallery widget. It left the sidebar on the main page. Pages automatic navigation menu set. Just add a page to your dashboard Manager in this salt automatically appear if you preview it (make sure you add a page widget)! This is a perfect choice to use. And i will share its only for you. Because Gourab design know all visitors problem. If you get some benefit from our post, then it's a good idea to stock up on a social site. And if there are some questions then me Comment here and ask here. I will reply quickly. help you easy work with blog layout.